The Breitling Diver Pro III rubber strap was introduced in 2013 and marks the return to the raised "hershey" style lettering that made the original Diver Pro strap so iconic and popular. 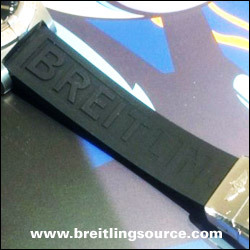 The new raised letter is different, however, and has the complete Breitling text on each side of the strap, with the last 4 letters "LING" being recessed rather than raised. Introduced at the same time with this strap was the new Blacksteel Deployant Buckle.